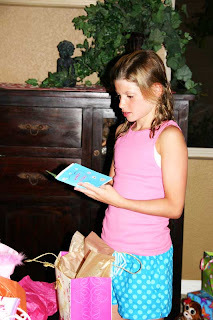 This year, for Hannah's Birthday, we went pretty low key. After all, the older they get, the more they can actually do for themselves. And I must admit, backing off really paid off in the end. No mess to clean that I was responsible for, no games to pre-plan to keep everyone happy and occupied. It was rather FANTASTIC I must say. Here's how I pulled it off. 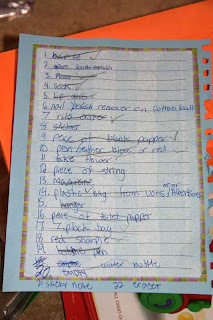 Each girl got some nail polish, a magazine (OOOOOOHHH, The Jonas Brothers.....OOOOOHHH), some cute little boxers and tee-shirts for sleeping in, some candy, lip gloss, mad libs...you get the picture, don't you?? 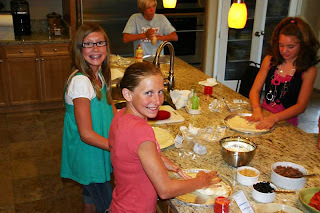 Then we bought lots of dough so the girls could fix their own damn dinner make pizzas and all the toppings one could want. 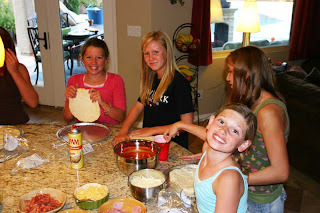 And we told them, anything they found in the pantry.....go for it! Here is the "anything-they-could-find-in-the-pantry" pizza. 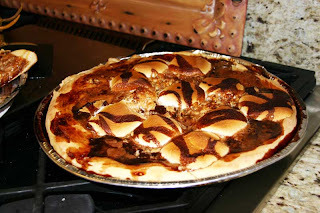 Looks like a ooey-gooey s'mores pizza......yuck! They actually ate some of it. 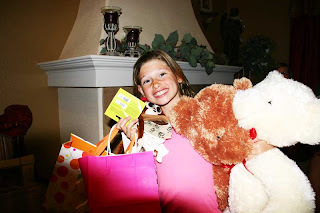 Here is Hannah opening her gifts from the girls. Because they just did what they wanted to for the next 18 hours. There was some swimming. Nail painting. (and yes, even Connor got his nails painted by one of the girls) Movie watching. And here are a few other highlights. 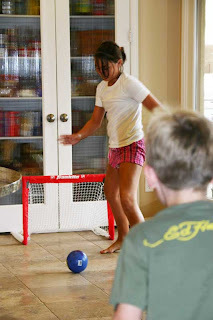 Soccer, kickball, and softball are, of course, always played in the kitchen. This was one of the most popular activities. 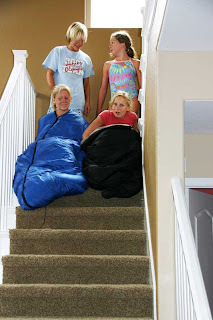 Sliding down the stairs in a sleeping bag. 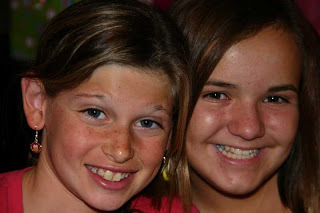 Sorry - to all the parents of these girls. Couldn't stop them from doing this - but no one got hurt!!!! I know they all are swimming in the Junior Olympics next week.....I know. So that's it. Success without the stress. I am so proud of my over-achieving, over-board, over-doing-it self. 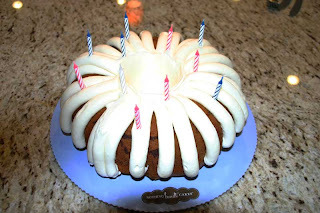 And as an additional little treat (in the form of a second birthday cake) Hannah wanted a marble pound cake from Nothing Bundt Cakes, to have with Chris and Allison and James, this afternoon. Yum. 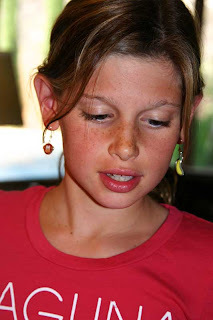 I can't believe she is eleven. And her most special ending to her most special day. Her most bestest friend Alex is spending the night tonight. Bill and I are lucky Hannah has such good friends. It is something you always want for your kids. Ok; that sounds like the best birthday ever!! 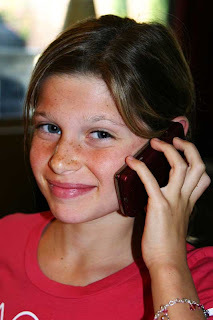 Hannah is gorgeous - inside and out - and I cannot believe she is growing up so fast. 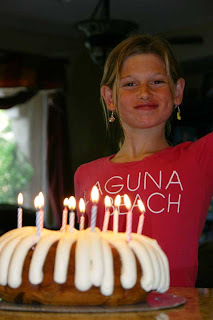 Love the pic of her sliding down the stairs and that cake ROCKED. 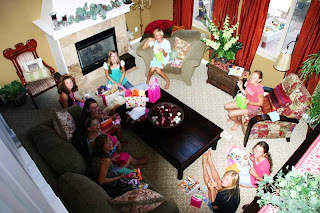 Nail polish, swimming, magazines, PIZZA - that sounds like a party I want next year! Good for you Gini, glad you could relax, and Happy Birthday to your cutie Hannah! Sounds like a great party! Ahhh...to be young like that again and stay up 'til all hours.